Craigslist and Ebay all in one place! 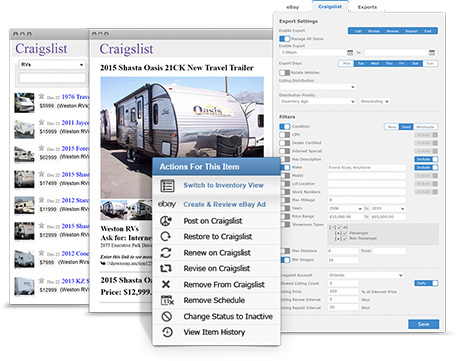 Select which inventory should be eligible for Craigslist through filters and distribution settings. Postings will be automatically launched on Craigslist during the days and times you want. The application can automatically Renew, Revise, Repost, and End your sold postings. Huge Lead Generator – Receive the contact information for all Bids and Offers received. Fully customizable template lets you convey the brand image and messaging you want. Cherry pick the units to list or let our fully automated listing process do the work for you. 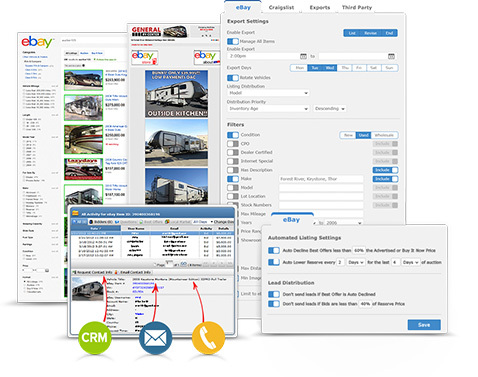 Contact your Account Manager for more info regarding current Craigslist and Ebay solutions.